Campus researchers have found that taking a nap during the day can help rejuvenate the brain and increase its learning capacity. UC Berkeley students talk about why, how often and for how long they nap. UC Berkeley Freshman Jesus Quiroz said he averages six hours of slumber on any given weeknight. But a quick catnap often provides him with the sleep he said is needed to get him through the day. "My schedule is pretty demanding," he said. "I feel better, more refreshed and more clearheaded." Though afternoon napping may not seem to be the most productive use of time, a new study by a research team including Matthew Walker, a campus assistant professor of psychology, corroborates Quiroz's claim, finding that one hour of sleep in the middle of the day results in increased learning capacity. According to the study, 39 young adults were separated into two groups, one of which was allowed to nap. Beginning at noon, the subjects were asked to perform a memory exercise in which members of both groups performed equally well. After being allowed to rest for 90 minutes, the "nap" group performed better than before, while the members of the "no-nap" group demonstrated a decrease in their ability to memorize, according to the study. The researchers' findings-presented Feb. 21 at the American Association for the Advancement of Science-suggest that afternoon napping may lead to an increased capacity for learning. "It is like the 'general inbox' of your brain is full of messages," said Bryce Mander, a postdoctoral fellow at UC Berkeley who was part of the research team, in an e-mail. "You need to clear it out before you can get more messages. That is where we believe sleep may come to the rescue." Seung-Schik Yoo, an associate professor of radiology at Harvard University, said that even short periods of sleep are beneficial. "A one-hour nap or even a 20-minute nap (will) act as a reset button for a lot of things," said Yoo, who studied sleep deprivation and its effects on learning with Walker in 2007. Yoo said the 2007 study found that staying up all night to study may be counter-productive. 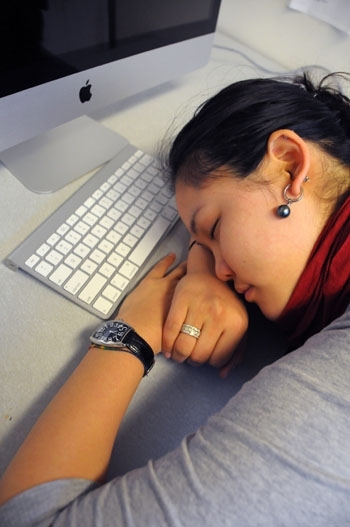 "All-nighters can upset the circadian rhythms," Yoo said. "(They) may not help in the long term-after 36 hours of non-sleep, there was a large decrease in memorization ability." Some students said getting a good night's sleep is a better idea than spending time sleeping during the day. Freshman Karina Macias said she averages seven hours of sleep every night and rarely needs to rest during the day. "I feel like I could use my time more productively," she said. "I'd rather go to bed an hour earlier than take a nap." Mander said in the e-mail that plans are under way to explore how specific the effects of napping are on human cognition. The effects of aging on learning will also be studied, according to Mander. "We are learning you also need to sleep before learning (in order) to refresh your capacity to record new information," he said in the e-mail. "This will lead to maximally enhanced learning."